A China book "out of the box"
The China approach of the author Harro von Senger - a Swiss lawyer and a PhD in law - is unique. Most Western books on China published for a broad audience are not written by legally educated persons. It seems that no Western journalist with a thorough legal background has ever been appointed as foreign correspondent in China. There exist Western sino-jurists, but they publish only on legal issues for a narrow circle of specialists who are interested in Chinese law. Western sino-jurists do not write on Chinese topics of general interest, and the people outside the legal sphere do not know them. Harro von Senger is, as far as can be known, the only Western lawyer writing not only on Chinese Law, but also addressing the general public in publications of a broad interest. Because of the uniqueness of Harro von Senger's juridical, and his normative approach to China, his book is "Truly out of the box" in different aspects. Lawyers take words and their meaning(s) very seriously. They know that a word is not unseparatedly linked with one eternally fixed meaning. And lawyers know that there exist different legal systems, for instance the Continental Law in mainland Europe and the Common Law in the English-speaking world. Therefore, lawyers are aware of cultural differences. The common Western literature on contemporary China does not discuss epistemological problems which have to be put into consideration in order to achieve intercultural understanding. For Harro von Senger, epistemology is an issue. Following Michel Foucault, he argues that persons of a certain culture have a "coded eye" which makes them view the world based on certain culturally rooted mental predispositions. Before looking at China, Westerners should become aware of their occidental "coded eye" shaped by ancient Greek philosophical thought, ancient Roman law, the Judeo-Christian tradition, the Enlightenment and hundreds of years of colonialist supremacy over the world. On the other hand, Westerners should consider that Chinese people have their own "coded eye" influenced among others by Military Theory, Confucianism, Legism, Taoism, Buddhism and contemporary Sino-Marxism. Therefore, Westerners should not fall into the trap to assume that the Chinese mind is in every respect identical with the Western mind and that Chinese words which on the surface correspond to Western words have always exact the same meaning as their Western "equivalents". Westerners should also not believe that for every Chinese word and concept, there exist a ready-made Western word and concept. They should not underestimate the complexity of Sino-western exchange of ideas. The common Western literature on contemporary China is based on a phenomenological approach. Phenomena which can be photographed and filmed or talks which can be registered with a smart phone are the main attractions. This bottom-up approach is focused on actual developments and events in the grassroots of the society. Furthermore, Western China watchers analyze Chinese phenomena according to economic, political or other theories conceived by Western people mostly based on their experiences with Western societies. Harro von Senger does not neglect grassroot phenomena, but primarily attaches importance to a top-down approach to China. He considers China as a state with a strong and rather efficient central government. Therefore, he considers it as crucial to analyze the way of thinking and conceiving the future on the top level of the Chinese society. For decades he has observed carefully official Party and State documents. He also reads Chinese newspapers and magazines intensively since decades. He does not at all agree with the widespread Western prejudice that official and semi-official Chinese publications are irrelevant. According to his experience, the contrary is true. These publications are key to understanding what is going on in China and to foresee what will happen in this country both in the near and far future. 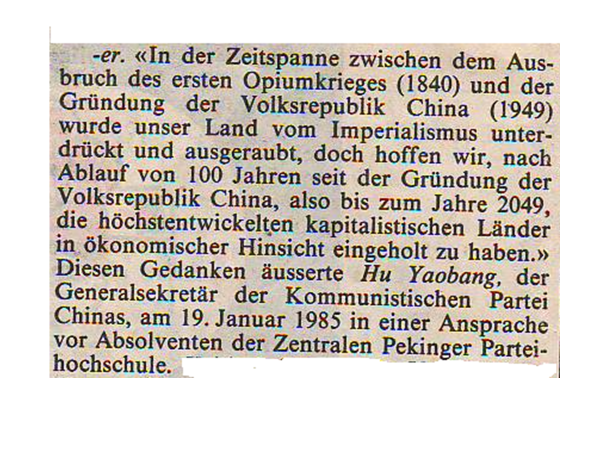 In his book Moulüe - Supraplanung, Harro von Senger refers to an article he had published in April 1985 in the renowned Swiss daily Neue Zürcher Zeitung under the title "China in the year 2049". In this article, he quotes the secretary general of the Chinese Communist Party Hu Yaobang who, according to a report in a Chinese newspaper, had said in January 1985 that "we hope that 100 years after the founding of the People's Republic of China , we shall have caught up with the most advanced capitalist countries in economic terms." At that time, as far as is known, nobody else in the Western world had noticed this vision for the year 2049 proclaimed by Hu Yaobang in 1985. Characterized during decades by its non-interest for the normative canopy stretched over China, the Western world was lost in the observation and analysis of Chinese statistics and scattered events causing a stir in the Chinese society. The first American publication on the 2049 goal dates 2015 It is based on a review of a Chinese book in the Wall Street Journal of 2013. 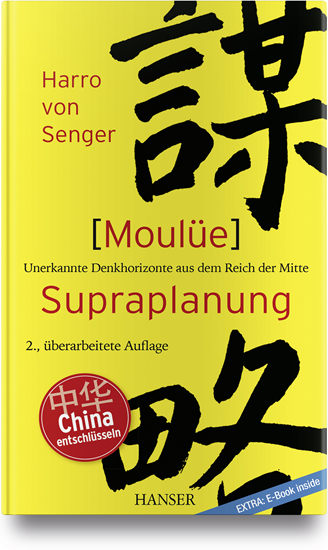 Thanks to his knowledge of the Statutes of the Chinese Communist Party of 2002 and 2007, Harro von Senger created the formula "Zwei Hundertjahresziele = Two Centenary goals" in the first edition of his book Moulüe - Supraplanung (München 2008), four years before Xi Jinping started to speak about the "liang ge yibai nian mubiao = two centenary goals". In the eyes of Harro von Senger, the economic development of China since more than four decades was foreseeable. The scientific achievements of China since 40 years were foreseeable too. 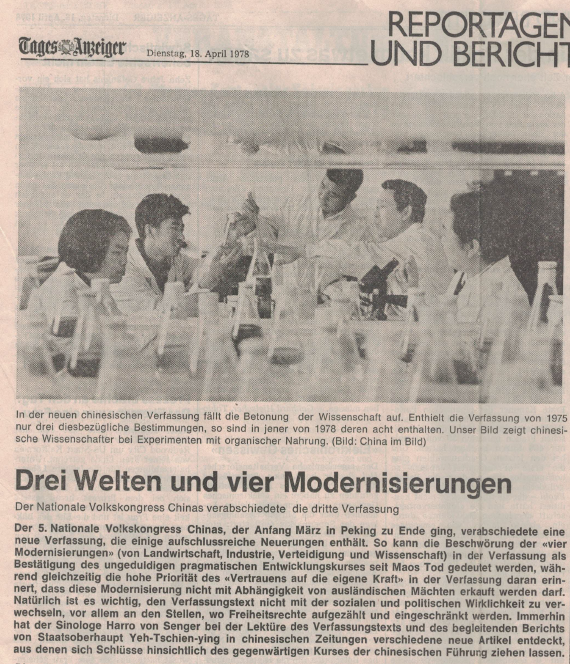 In March 1978, the Chinese constitution was amended, and Harro von Senger published in April 1978 an article in the Swiss daily Tages-Anzeiger pointing in the title of the article to "The Four Modernizations" of agriculture, industry, national defense and science and technology. In 1978, it was foreseeable that sooner or later China would launch rockets to the moon or even to the back of the moon and build air craft carriers. Today's sudden Western bewilderedness about the economic and scientific rise of China would have been avoidable if in the West a correct epistemological approach to China would have been used. 5. Common Western books on China do not duly consider peculiarities of the Chinese culture. One of these peculiarities is the millennia old Chinese wisdom concerning the handling of military matters. A fruit of the military erudition is the concept of "Moulüe". It has its origin in The Canon of War ascribed to Sun Zi. According to Harro von Senger the scope of "Moulüe" has not been properly expressed in Western languages. For example, Michael Pillsbury, who is said to be "one of the US government's leading China experts", translates "Moulüe" as "deceptive strategy" , which is very superficial. So Harro von Senger coined the word "supra planning", which he says is superior to the "strategic thinking" considered in the West to be the highest level of planning. "Sometimes, we need to coin a word to call attention to a unique phenomenon of another civilization," von Senger says. He says, "supra planning", or "Moulüe", is a broad-based art of planning only developed in China. He explains "Moulüe" by using the Yinyang symbol. The Yang part refers to laws, regulations, customs and routine. But the Yin part refers to hidden ways to solve problems and requires wisdom in the Chinese sense of the word and creativity. In addition to the yin-yang peculiarity of supra-planning, von Senger says its other feature is long-term thinking. 6. The uniqueness of Harro von Senger's book is acknowledged by the China Daily, the Chinese English-language newspaper with the widest print circulation: "His book Moulüe is so far the only Western book on this topic."